The alleged fourth century account of Pachomius speaking in tongues is an important document in the tongues debate. It distinguishes itself as one of the few, if any, personal experiences of tongues speaking within the realm of ecclesiastical literature. The many other remaining accounts are theological assertions. This distinct characteristic makes the Pachomian text a very important study, and requires serious further investigation. 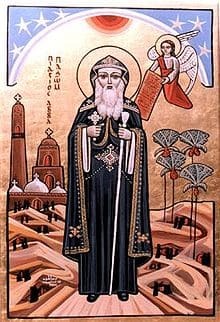 Pachomius was a fourth century Egyptian Christian who was influential in establishment of the christian cenobite movement — a tradition that stressed communal rather than isolated personal monastic living. This system of religious living became the example for later monastic movements. A short literary analysis clearly demonstrates that the author(s)/editors of this work, believed this gift to be the supernatural endowment of foreign languages. There was no other allusion to anything else. The complete English translation of this text can be found at Pachomius Receiving the Gift of Tongues in English and Greek. There are still some questions from a technical perspective that need to be answered, such as did Pachomius hear and speak in one sound, or in many languages. Was this a temporary or permanent gift for Pachomius? What words were used in the Greek and Syriac that relates to tongues? Were these consistent with the ancient usage or are there new words added to the tongues vocabulary? One voice, many sounds? Or did he speak in all languages sequentially? The answer is neither. The text indicates that he had the understanding of all languages and could choose whichever language was most convenient at that moment. Was this a temporary or permanent endowment? There is no explanation here on whether it was temporary or permanent. However, the authors/editors of this work wrote about Pachomius in heightened mythical proportions. They would no doubt believe that Pachomius would have the ability when required. τὴν ἑλληνικὴν γλῶτταν. –The Greek Language. Γλῶτταν is found in the writings of Chrysostom and other eastern writers. Lidell and Scott name γλῶτταν as the Attic alternative to γλῶσσα. This is the only occasion it is used in the text, whereas γλῶσσα is used afterwards. Why? It may be that it was a fixed idiom that grammatically forced Greek writers of any subdialect to conform to. One was to properly write it as τὴν ἑλληνικὴν γλῶτταν and not τὴν ἑλληνικὴν γλῶσσαν. τὰς γλώσσας τῶν ἀνθρώπων –the languages of men. The Pachomius’ text clearly defines the gift of tongues as human language. εἰδέναι με τὴν ὁμιλίαν αὐτῶν –that I may know their languages. Ὁμιλίαν is not used in the Greek New Testament in reference to the tongues doctrine. This Greek word is the basis for what is now known in English as homily. It could be understood here that the emphasis is not so much on the language itself, but an organized speech, instruction, or lecture.2. However, the Syriac has ܕܐܸܕܲܥ ܡܿܲܡܠܲܠܗܘܿܢ –that I may know their speaking which attests to the fact that the word homily had yet to mean instruction or lecture at this timeframe. Language or vernacular is a better English equivalent in this context. ἔμαθεν πασῶν τῶν γλωσσῶν τὰς λαλιάς –he learned the speech of all the languages. Λαλιάς means speech, conversation, loquacity, talk or chat.3 and is used in the plural here. It literally translates as he learned the speeches of all their languages. However speeches is awkward. The singular works better in English and still conveys the thought properly. The root of this form is part of the modern term glossolalia but it does not convey this sense here. καὶ ἤρξατο αὐτῷ διαλέγεσθαι –and he began to converse with him. Nothing surprising or unusual here. Alternatively it could read, and he began to speak with him. εἰς τὴν διάλεκτον –in that language. Διάλεκτον is a synonym to γλῶσσα with a slight more emphasis on speech, than language, but the distinction between the two is so fine, there is no cause to dispute between the two. Greek was the international vernacular which was slowly being supplanted by Latin. Pachomius’ ability to speak in these two languages was symbolic of the Christian faith being established for all the nations. It was an international religion. Literary Fiction, Legend, or Reality? The life of Pachomius is full of magic, miracle, and mysticism. It does not reflect a typical written legacy of Patristic literature of the fourth century. It does blend in better within the seventh century and forward where the emphasis on magic and miracle were much more prominent. One of the parallels is the Venerable Bede’s account of St. Aidan. My first initial thought about this text concluded that it was the legend of Pachomius added three hundred or so years later. The Catholic Encyclopedia has noted that at least one major scholar has concluded this, but others have found this document of historic value, and deny such a claim. Regardless of whether it is the legend or accurate portrayal of Pachomius, the text on him speaking in tongues has historic and didactic value in tracing the Christian doctrine of tongues evolving from inception until this time. Pachomius Receiving the Gift of Tongues in English and Syriac. It is speculated that the original work referring to Pachomius speaking in tongues was in Greek, though there have been arguments for the Latin, and lesser, that of Coptic. There is an old Latin text published by Rufinus that is available in Migne Patrologia Graeca Volume 34, but it does not contain the Pachomius tongues speaking sequence. Specialists in this field have been attempting to reconstruct a source text of the Lausaic History along with its appendages, but there is no uniformity on this. For more information see Dom Cutler Butler’s, The Lausiac History of Palladius. These manuscripts have yet to be consulted and compared. The Syriac text was originally translated from the Greek by a Syriac Monk named Anan-Isho in the later half of the seventh century. There have been arguments that this text has further interpolations than the original, but in the case of the Pachomius receiving the gift of tongues text, there is little difference between the Greek and Syriac. It can be generally established that the text of Pachomius receiving the gift of tongues reflects an Egyptian Christian perception anywhere from the fourth to seventh centuries. Pachomian Koinonia. Cistercian Studies: Number 46. Volume 2. Translated by Arnand Veilleux. Kalamazoo, Michigan. Cistercian Publications Inc. Pg. 51-52. St. Paisios of the Holy Mountain (d.July 12, 1994) is a modern example of the gift of languages at work. Among other accounts, is his communicating (he spoke only Greek) with foreigners who did not know Greek, holding an extended conversation without an interpreter, where all parties clearly understood one another. St Paisios is not the only example of this. Never heard about this person and would like to know more, especially if it can be substantiated by a credible third party.